Lynn D. Compton, a lawyer and later a judge who was best known for leading the prosecution of Sirhan B. Sirhan for the assassination of Robert F. Kennedy — that is, until more than 20 years later when his heroism during World War II was made public in “Band of Brothers,” the best-selling book by Stephen E. Ambrose and the subsequent HBO miniseries, died on Saturday at his home in Burlington, Wash. He was 90. Mr. Compton, who was known as Buck, was a deputy district attorney for Los Angeles County in California for nearly 20 years and a specialist in major felony cases. In 1969, as chief deputy district attorney, he won a conviction in the Sirhan case for murder in the first degree, scornfully dismissing the defense’s contention that Mr. Sirhan, who is still in prison, had been psychologically unstable and thus incapable of premeditating the June 1968 shooting of Senator Kennedy at the Ambassador Hotel in Los Angeles. Kennedy had just won California’s Democratic presidential primary. During the trial, Mr. Compton was described in news media reports as a decorated war veteran, but the tale of his bravery, along with that of his “brothers” in the Army’s E Company — also known as Easy Company — in the 506th Parachute Infantry Regiment, part of the 101st Airborne Division, was not revealed in detail until Mr. Ambrose’s book was published to popular acclaim in 1992. “Band of Brothers” told the story of the 140 men and 7 officers of Easy Company. As commander of its second platoon, Mr. Compton parachuted into Normandy early on D-Day, June 6, 1944, fighting at Brécourt Manor and Carentan, and later in Holland and at the siege of Bastogne. He received a Silver Star, a Purple Heart and, along with his unit, the Presidential Unit Citation for heroism in the face of an enemy during the Battle of the Bulge. The book was adapted for a 10-part miniseries on HBO, first shown in 2001, with Tom Hanks and Steven Spielberg lending their celebrity clout as executive producers. 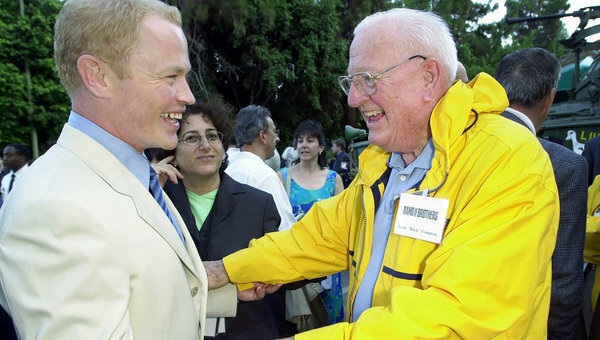 Mr. Compton’s role was played by Neal McDonough. He was born Lynn Davis Compton in Los Angeles on Dec. 31, 1921, but as a boy gave himself the nickname Buck because he thought Lynn was a name better suited to a girl. His father, Robey, was an escrow clerk; his mother, Ethel, worked for movie studios, and young Lynn got work as an extra in films. During the shooting of “Modern Times,” he somehow angered the star, Charlie Chaplin, who threw him off the picture. An athlete, Mr. Compton competed both in baseball and football at the University of California, Los Angeles, where he played in the Rose Bowl and where he overlapped with Jackie Robinson in both sports. He completed the ROTC program at U.C.L.A., and was commissioned as a second lieutenant. After the war, Mr. Compton joined the Los Angeles Police Department and attended Loyola Law School. He was admitted to the California bar in 1949 and joined the district attorney’s office in 1951. In 1970, Mr. Compton was appointed to the California Courts of Appeal as an associate justice by Gov. Ronald Reagan. There he earned a reputation as one of the state’s most conservative jurists, retiring in the early 1990s. His memoir, “Call of Duty: My Life Before, During and After the Band of Brothers,” written with Marcus Brotherton, was published in 2008. Mr. Compton’s first marriage ended in divorce. His wife, the former Donna Newman, whom he married in 1947, died in 1994. He is survived by their daughters, Tracy and Syndee, and four grandchildren. Rest in Peace Mr. Compton. Great pic of him and the guy who played him in the series. That really was a top notch production and i enjoyed hearing from the men themselves afterwards commenting on the guys who played them and some of their "war" stories. That Bill Guanere is on several different videos and he seems to be quite the character. Yes, rest in peace Mr. Compton, you were indeed a great American, an asset to your nation.